The model for the Hôtel des Étrangers in F. Scott Fitzgerald's Tender is the Night, since 1870 the glamorous white-walled Hotel du Cap on the French Riviera has been one of the most storied and luxurious resorts in the world. Visitors should not expect to find the wide swaths of beach that they might in the Caribbean--the beach in fact is quite small and rocky, like most in the south of France--but what they will find is incomparable elegance bordering on opulence. 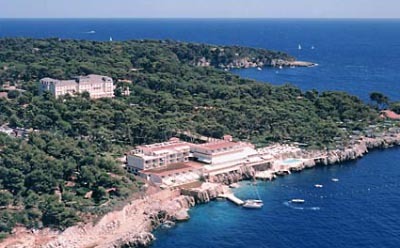 Situated on a 22-acre private peninsula jutting out into the Mediterranean, the hotel is famous for favoring celebrities and the very wealthy--which seem to comprise most of the guests. Everything here is first class and commensurately pricey.